Obamacare: A trick or a treat? A day after apologizing and taking responsibility for the problem-plagued Obamacare website, Health and Human Services Secretary Kathleen Sebelius got subpoenaed on Thursday by one of the fiercest Republican critics of the administration - House Oversight Committee Chairman Rep. Darrell Issa of California. Things are looking gloomy for President Obama as well. According to Gallup's latest daily tracking poll released Thursday, only 41% of Americans approve of the job Obama's doing, with 51% giving him a thumbs down. 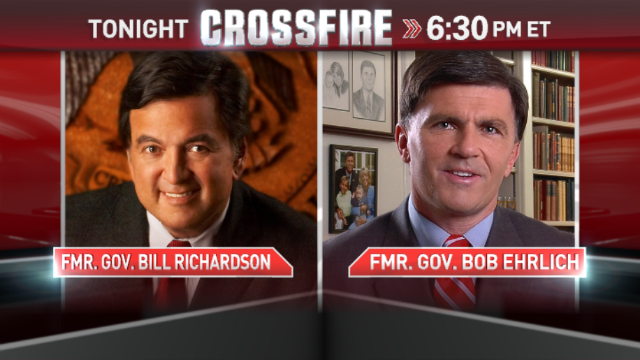 In the Crossfire tonight, Former New Mexico Governor Bill Richardson and former Maryland Governor Bob Ehrlich join Newt Gingrich and Van Jones to debate Obamacare. We want you to weigh in: Is ObamaCare a trick or a treat? Vote by tweeting with Yes or No using #Crossfire, or comment on our Facebook post. View results below or through our Poptip results page if you are on a mobile device. To GOP, it is a trick, they tried 41 times to overturn the law. To American, it is a long awaited treat, finally, American has access to affordable health care, treated like a human again. What? Even the Democrats in the Chamber are screaming they were lied to. They now estimate upward of 12 million people will be getting cancellation notices by the end of the year. And that will only go up next year. Exactly where are you seeing the affordable health care???? It doesn't really matter. It's the law. So stomp your feet and complain and moan...but get compliant with the law or pay the fine. Is that how you felt about slavery, or would you help with the underground railway? Would you have stood by and complied with restrictions against women voting, or would you have joined women's suffrage? Could we find you in a speakeasy during prohibition? Did you blindly follow the Jim Crow laws or did you side with Martin Luther King Jr.? Obamacare was not justly passed. It violates human dignity and denies our rights. It should be opposed as in all these other cases of laws that were once passed, but proved to be inequitable encroachments on our liberties. that you need an operation to save your life. WELL... Let's see... IF... you qualify ??? Do you own an American flag ? Do you own a Bible ? Do you own ANY firearms ??? Have you served with honor in the US armed forces ? Have you EVER listened to "conservative" talk radio ? Are you opposed to federal funding of ABORTION on demand ? APPLICATION DENIED !!! !!! !!! This is a thank you to all of the people who supported the tea party on Television and radio because this is the way that the republican party is going to finally be destroyed by their own baton. And no one will be able to blame the democratic party for the republican party downfall. The only ones that you must truly blame is the moderate republican leaders on television, radio, and the internet blogs for not finding their own version of the Koch brothers who would support the moderates republican in their own party especially doing the primary season. As a democrat this is something that we all know that people said and wrote about back in the late 50’s, 60’s and early 70’s was going to happen to the democratic party during that time. That was the African Americans, Jews, the liberals, the women groups and the Catholics was not going to be able to come together as a group for the benefit of the democratic party and that was going to destroy the democratic party but the party never ever had a Koch Brothers type of billionaires to deal with who would work hard to sabotage the party within. You are correct Tony. between all of the great brainless politicians in the Teapublican party's and the KOCH-SUCKER brothers, they will soon self-destruct, just about right on schedule. With 2014 elections insight and 2016 right around the corner. What I think is great, is they keep up their racism against everyone that isn't white and they are still doing the voter suppression thing. I predict a great turnout for the Democratic party in both elections, just because of those 2 things alone. Vote all of the Republicans and Tea Party idiots out of politics and put them on the unemployment line. You need to be schooled on a few things here; There are no TEA Party members, people do not register as TEA Party members, one cannot give money to the TEA Party as you can to the DNC or the RNC, and the TEA Party are not necessarily Republicans (judging from the popularity of Ron Paul, I would say that they lean more toward Libertarianism). The Koch brothers give money, not to any "TEA Party" but, to Republican causes as is there right, but it is nothing compared to the funding that George Soros gives to Democrats. The TEA Party is most certainly not racist, black people are welcomed in the TEA Party and there are several key black Tea Party advocates and leaders. If you can point out even one racist advocating for the TEA Party principals, then name him! He will be excommunicated so fast it will make your head spin. It is completely hypocritical for Democrats (who fought as the South against the Republican Abolitionist, under Lincoln, during the civil war, and started the KKK afterwards) to make such a charge, but this kind of name calling is a typical liberal tactic. Thanks to ObamaCare, millions of Americans will lose their insurance coverage and insurance costs will increase. Thats ok, sign up on the exchange and help pay for the poor and for preexisting conditions. I want to thank the TEA Party as well. They were right all along about Obamacare; the mandate penalty is a tax, we can't keep our doctor or even the insurance plans that we liked, and Obamacare isn't going to save every family an average of $2500 a year. It's just like they said, I only wish that more people had listened to them so that all of this could have been avoided. Even many Democrats would not have supported this, if they had believed the TEA Party warnings. They will have my vote in the upcoming elections. When the watch dog becomes the provider, no longer is there anyone left to protect. Already we see this. Imagine if it were up to the insurance companies to have their websites up and running by October 1st and this was the result. Imagine if people were being cancelled from health insurance plans and losing their insurance and seeing such huge premium increases. Imagine what we, the consumer and citizen would have at their disposal to remedy this situation- the full extent of the law, fines, prison sentences, etc. So, what have we now to protect us? Talk, political rangling and posturing. When we view government as the provider, rather than the necessary evil it is, we remove our protection from those who would take advantage of us as we are seeing now. I like the saying, "I hope they really want what they say they want." Is this it? The sad part of government ran healthcare is that it doesn't work. Compared to private sector companies who survey, do market research and seek experienced folks to set up access to goods, services and then do end to end testing to ensure websites are up and running (before hand); competition demands a high ratio of success to failure, otherwise they are out of business. Government just throws more and more money at a problem, ignoring what individuals want, catering to mass appeal instead. The Legacy of this President is in question. Rightly so. His health care program may very well go down as the most expensive boondoggle in history – along with this Presidents credibility as well. The Administration is using it's power for the wrong things. I believe in Government working effectively for the people by the people. But this was a HUGE slip up. Obamacare does nothing but throw people on a system where, now, they are paying more! Drone strikes in the Mid-east, NSA spying - The Administration has explaining to do. The Democratic Party has lost the message they were trying to convey for the past 5 years. I am now a converted Libertarian. If the ACA can remove the mathematical fundamental of the insurance industry, risk assessment, by forcing companies to cover known sick people, and the ACA can somehow force insurance companies to provide more coverage for less, while limiting how much profit they can make .. it will be quite a trick. How about "too good to be true"? I feel like I've been in the house of horrors since Barak Hussein Obama took office. I know I read a lot of commentaries and comments from people at the get go before he was even elected warning about this guy's motives and twisted agenda as well as lofty ideals that would set us up for calamity. They were right. They saw through the b.s., the smarmy snakey ways. They could see the facts, knew the stats, trends and econmic data and wrote about it, tried to make people wake up from their bobbing head zombie zone of Obama worship. I was not really paying attention myself. Then the mass layoffs hit. Then the frenzy he caused in the middle east and the uprisings there happened. Then the deficit kept rising. Then TARP was forced on banks. Then CZARS were implemented into various roles. Then housing program acronyms were created daily. Then the states started getting sued by the feds due to immigration enforcement. Then we aided in the assasination of Ghadafi. Then we sssssssssssssss Then the social security holiday happened creating a halving of the trust fund's surplus balance. Then the ACA got pushed through. Then Fast and Furious scheme came to light. Then the attempt to bankrupt the coal industry happened The the scheme with Solyndra came to light. Then the Tea Party came into things. Then the signaling out of conservative groups happened from the IRS. Then I finally realized I needed to start doing my homework better, read between the lines of what this ego maniacal President was saying and get stronger in my personal convictions. Now I know what a dummy I've been. How stupidly blind I've been and how much I know our nation is hurting because of this one man's self serving desire to rule the world not with wisdom, clarity and faith, but with a dark and sinister desire to bankrupt America, crash the dollar, ruin private sector growth, keep people under the thumb of big brother, and take away the people's joy, dreams, faith, strength and independence. I pray for the voices and actions of other elected persons to do their best to turn this titanic around and give us back our beautiful happy and prosperous nation of people who once co-existed without so much noise and anger. Never have I witnessed so much stress and anxiety from society. It's bad. People just vent to total strangers and it was never that way before. It's like we're being tugged and pulled and forced to gnarl at each other because Obama wants people to be like rabid dogs tearing at each other. He's taken income and wealth and used it to make a horrific societal battle that there is no need for. I feel like a big crap head jerk for not listening to the voices of reason and clarity. I ignored their pleas to read up on things, look up the economic data, etc. They tried so hard to make their voices heard and they were drowned out by freaks and people that call themselves progressive liberals. It's not too late to make it right in America or at least better and less dark and dreary. I want the sunny days to shine again. And I want to see my daughters bloom and grow up to be strong, independent, successful, happy WEALTHY women who can take care of themselves. I pray for them and all kids today that are so miserable and sad watching their parents deal with their anxiety, stress and anger. I hope the President's voice is silenced by the voices of others now. Sorry a viable choice has to be there and Palin cost Republicans the first election, then they fielded people like Perry and settled on Romneycare Romney the champion of flip flop who threw away the 47% at a 1%er dinner. Health Care web site is not alone. Get a clue not even the big insurance companies can get a web site right. Just tried to log into Anthem and guess what "Sorry, we’re having some technical problems getting your account. Please try again later or call our Technical Support team at 1-866-755-2680 Monday – Friday 8 a.m. – 8 p.m". This happens on a regular basis with Anthem. Its time the idiotic insurance companies and all of their paid off politicians, yes you Ted Cruz, were told to sit down, shut up and color. And by the way Cruz, go back to Cuba and take Sarah Palin and Michelle Bachman with you. You are completely delusional if you think that insurance companies (no matter who, Democrats or Republicans, you think are on their payroll,) are some how sabotaging Obamacare. Think for a minute: Who wants the "individual mandate" forcing every American to become a costumer of the insurance industry? And: Why would insurance companies want to infuriate half of their present customers by cancelling their present policies, without having the law on their side? The insurance companies know that they won't loose their clients, they will just be "transferred" into more expensive plans that call for higher premiums and deductibles. The "idiotic insurance companies" are with Obama on Obamacare; Why aren't they speaking up right now while Obama falsely blames them for cancelling policies? They are in cahoots, open your eyes! Millions of new mandated customers at prices the insurance companies set. Insurance companies are delighted. Forget the ACA website problems. Millions of Americans are losing their insurance coverage because of the ACA and many more Americans insurance costs are increasing. You forgot, when President Obama wanted the Insurance companies to endorse his ACA they became HEROS, now they are the villains. With Obama it's all about how much he can take from the wealthy. Because it'd their fault we are in this mess – not the Government. Obamacare, trick or treat....... Time will tell, but it is more than the GOP has done towards fixing healthcare in 20 years. If you don't like it, then get off your disproportionate behind, call your Congressmen; and tell them to come up with something better. However, the better; cannot be nothing, which is what the GOP has excelled in. Time for the GOP to do something more than complain and whine like babies with dirty diapers. I think the GOP was right when they said this law was bad and they were right. People are losing their insurance coverage and some peoples insurance is increasing in price. Obamacare isn't a "Halloween Joke". There are real people who's lives depend upon this healthcare law. Instead of always focusing on the negative, why doesn't CNN starting talking to parents who have children with pre-existing conditions ect.. We need to hear more about the lives of people that the law has impacted and has truly made a difference in every day to day living instead of all the bad. The law is working and has been for over 2 years. Once the website is up and running efficiently things will be all good. The ACA hs been working because the deductible has been $2,000, not $6,000. This stage of enforcement has cost you approximately $4,000. It will only get worse. Just wait til the Affordable Immigration Act is passed by democrats. Explain, how poor people can afford a $2000 deductible if they can't afford to buy insurance for a few hundred dollars a month. Trick. Greatest Trick ever pulled. Do you think that our government is going to provide any kind of decent health insurance. It was a TAX buildup. There are over 200 billion dollars of taxes attached to the affordable health care act. Now we have our most basic of liberties taken away from us. The freedom of choice. Healthcare is just the start, next will be religion, after that will come everything else till we are in a socialist nation. Want to keep loosing your freedoms. Then keep voting for idiots like Obama. In another 8 years we can give communist China a run for their money. Obama can demonize the insurance industry all he wants by claiming they are the ones responsible for dropping all those millions of people off of their policies, he and everyone else knows, that the insurance companies are only following the law of Obamacare. Behind the scenes Obama is in cahoots with the insurance lobby after all, for his law (written largely by them,) is forcing millions of people to become unwilling costumers of theirs! Let's face it, Obamacare is not healthcare it is an insurance scheme, it provides healthcare to nobody, rather, it forces everybody to purchase insurance. Common sense would tell us that it is more expensive to pay for healthcare AND insurance than it is to pay only for the healthcare. The insurance itself is an unnecessary added cost that is being forced upon the people of the United States by the Obamacare bill. Forcing everyone to pay for their healthcare through some third party payer such as an insurance company costs everyone more, not less. Insurance is not free, and it is not a necessity. Insurance is a parasite on the doctor patient relationship, siphoning billions of dollars from, not only doctors and patients, but from even potential patients, and in fact, from everyone if we allow mandatory insurance to stand. The government wants to get it's hands on that healthcare insurance money. That is why the government is pushing so hard for insurance reform, it wants to "reform" health insurance into an arm of the government. Now, when people are beginning to complain about Obamacare, Obama is disingenuously blaming the insurance companies for the problems he has caused; it's just plain disgraceful. Since when is it okay for the government to tell the American people what is good for them? I have listened to your debates and you people can't even talk to each other in a decent manner let alone make a decision for someone else. The majority of the people didn't want this health care plan so why was it even voted in? You people in D.C. need to get a grip and realize it's not what you want it's what the people want. You sit there and talk about how good it is but yet you are exempt from it! This plan stinks and know one wants it, it's just more control and taxes, your not fooling anyone. Obamacare is a trick does nothing to help middle class or young Americans and the democrats will see this on Election Day ! Live by the rules you pass and walk a day in the middle classes shoes before you pass bills that do nothing to help us. I is a treat just needs unity not conflict. Just what we need is 4 more talking heads that don't know a fix for anything. WOW!!!!! The only thing that is going to solve our country's main issues is Americans getting out and voting these scumbag Teapublicans out of politic forever!!! S.E. Cupp should prove my point, she thinks Ted "Fidel Castro" Cruz is a hero... What kind of stupidity is that????????? Doesn't take a genus to figure this show shouldn't be on TV,Cable, Radio or even on this planet...Time to stop taping forever!!!!!! The teaparty didn't create this bad ACA law nor did they vote on it. This is your heros fault, that millions are losing their preferred insurance and its Obamas fault that Amercians insurance is increasing in price. Obummercare is a Scam, would give ya 10 cents for it ! A law is a law is a law, no matter how you flip it. Don't like it? just move on or move out. After all, free to choose.